Lock in a great price for Hotel Sandra - rated 9.3 by recent guests. the best things were the hosts: Sandra and Reuben who were exceptionally cheerful and hard working and helped us with our many questions, the location and cleanliness. Breakfast was a feast. The staff is very friendly and helpful. Even though we hardly speak any Spanish, we managed to communicate very easily. The room was clean, the shared bathroom, too. You can reach all the places by walking because the hotel is situated quite central. A very pretty and charming hotel. 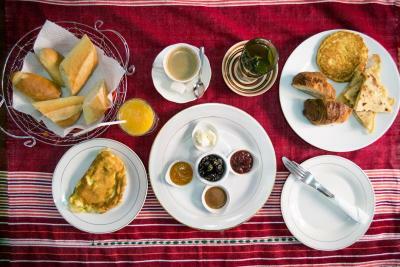 Easy check in, really lovely hosts focused on providing great customer service, spotlessly clean, small but very comfortable room, shelving and lots of hangers and hooks is a real bonus in Morocco and by far the best and most generous breakfast we’ve had in Morocco. The owner doesn't speak English well, but tries to help always. The location couldn't been better which is inside of the old town. I had a good stay. 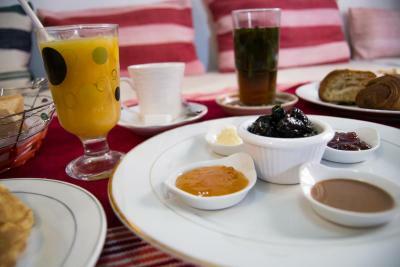 In the heart of la Médina, the hotel offers a great experience in Chefchaouen. The hosts were welcoming, warm-hearted and helpful. Totally recommend it! The hosts are very friendly. I enjoyed getting to know a little bit more about the country directly from the people whi live there. For me, was a good thing that they talk spanish. They with anything I needed. 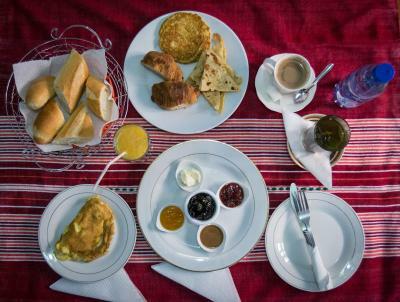 Beautiful place, incredibly extensive and delicious breakfast, super friendly staff! Good location, friendly staff, the room was very clean. He helped us carrying to taxi. Great experience! Amazing host. Very responsive when we were messaging via booking.com. Typically reply in a few minutes. She came picked us up outside of the Medina since she was worried we will get lost. Mint tea for welcoming. Clean room and washroom. Hot water and good water pressure for shower. Great location inside the Medina. People said it’s cold at night in the winter time but I found it alright. They have a heater and extra blanket in room if you are worried about the cold. Description said no kitchen but there’s one. We asked and she allowed us to use it. Good wifi. We had a great stay. We stayed for 3 days. On the second day, she asked if we need the room to be cleaned and if we need new towels. When we leave, she walked out of the Medina with us and caught a taxi for us to the bus station. Recommended. 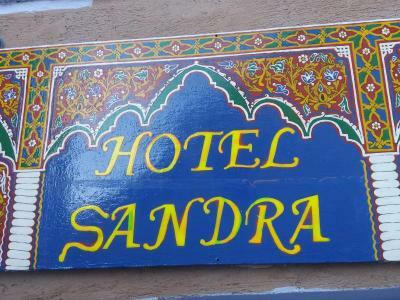 Set 200 yards from Kasba, Hotel Sandra provides rooms with air conditioning in Chefchaouene. 200 yards from Outa El Hammam Square, the property is also 0.7 miles away from Mohammed 5 Square. Free WiFi is provided. At the guest house, every room includes a wardrobe. Khandak Semmar is 1.2 miles from Hotel Sandra, while Ras Elma Water Source is 1.8 miles away. The nearest airport is Sania Ramel Airport, 42.3 miles from the property. 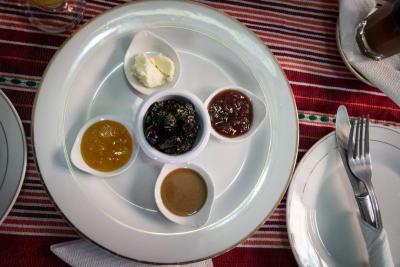 This is our guests' favourite part of Chefchaouene, according to independent reviews. This property also has one of the best-rated locations in Chefchaouene! Guests are happier about it compared to other properties in the area. This property is also rated for the best value in Chefchaouene! Guests are getting more for their money when compared to other properties in this city. Hotel Sandra has been welcoming Booking.com guests since 7 Oct 2017. When would you like to stay at Hotel Sandra? This twin room features a tile/marble floor and tumble dryer. This double room has a tile/marble floor, mountain view and seating area. Chefchaouene old town is a mishmash of amazing blue-hued buildings that climb up the mountainside. Amongst its vibrant narrow streets, you’ll find a souk selling clothes, souvenirs and jewellery. House rules Hotel Sandra takes special requests - add in the next step! Please inform Hotel Sandra in advance of your expected arrival time. You can use the Special Requests box when booking, or contact the property directly with the contact details provided in your confirmation. One of the most picturesque neighbourhoods in Chefchaouene! The shower was a bit weak and hard to turn off. The wasn't any AC in the room. But for the extremely cheap room rate, this small hotel has excellent value & I recommend anyone who wants to know the city inside and out within a day or two to stay at Hotel Sandra. Thank you again! This hotel is a gem hidden right in the middle of all the shopping! 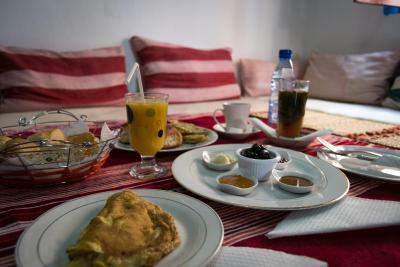 The owners were very hospitable and kind, especially the male host, who not only cooked us the best breakfast I've had during my 2 week stay in Morocco, but also brought a chair outside for me to sit while I smoked a cigarette. In addition, he willingly helped us carry our heavy suitcases to our van, which was parked relatively far away. This gesture was very much appreciated. The small size of the room with low door and protruding shelves meant we banged our heads several times each day. For me the bedding meant either too hot or just a sheet and not warm enough. The street noise goes on into the night, it goes with the handy location. The owners are fabulous, exceedingly helpful. Went out of their way to make sure our stay and visit to their town was great. Experienced some late night street noise, partly due to location near main square. This is a beautiful hotel. It is in an excellent location in the medina. It was super clean and quite comfortable. It had plenty of hot water and good heating. The wifi worked well. The breakfast was delicious. Sandra does a wonderful job. I would definitely stay here again. There was no hot water for a shower. Very pleasant staff.. close to Medina Central and to parking. A little bit noisy at nighttime. But that is not really a problem since they even provide earplugs. 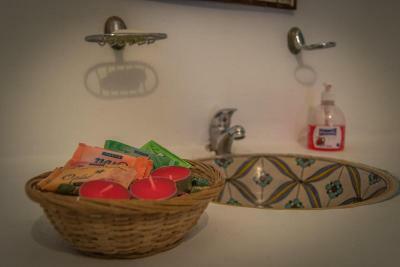 The hotel can be noisy, however, the hosts leave a set of earplugs for all guests which is s nice touch. Staff was really awesome, very personal and friendly, gave good suggestions and made sure I was comfortable. Room was clean, comfortable and a good value. Good location and fairly easy to find. I would recommend location to other travelers.